Bust of Queen Elizabeth II in centre, encircled by lettering. Two beluga whales swim alongside a bowhead whale. Regarding the coins where the bowhead whale is frosted, there are two sub-varieties : on one, the fin tip that sticks out under the belly is frosted, while on the other one it is not. A group of three men aboard a dogsled, the waiting dog team before them listening for the command to move on across the Arctic tundra. The skyline and horizon in the background are filled with a stylized image of a compass. In 1913, an international crew of scientists, sailors, guides and crewmen called the Canadian Arctic Expedition (CAE) set sail on a remarkable voyage of discovery in Canada's High Arctic. During the five years that followed, their work would touch unprecedented facets of Canada's far-flung northern reaches, including: previously unknown lands and islands, as well as thousands of photographs, artifacts and specimens that offered Canadians a glimpse of life in the Arctic. Their discoveries not only better defined Canada's northern boundaries, but fundamentally contributed to Canada's scientific, social and cultural knowledge of the Arctic and the people who lived there. Your 12-coin set commemorates an important event in the history of Canada! Ideal for your Canadian history display or to give to a friend to start theirs! This coin was designed by Canadian artist Bonnie Ross and draws on photography from the Canadian Arctic Expedition. The coin depicts a group of three men aboard a dogsled, the waiting dog team before them listening for the command to move on across the Arctic tundra. The skyline and horizon in the background are filled with a stylized image of a compass. Designed by renowned Inuit artist Tim Pitsiulak, this coin includes a beautifully detailed design that combines animal and human imagery. A traditional whaling boat and three kayaks wrap around the image along the rim to depict a traditional bowhead whale hunt. Two beluga whales swim alongside a bowhead whale – animals that have long been a source of inspiration to the artist. The bowhead is adorned with several elements drawn from the Inuit culture. To honour the Tuniit people who first crossed the Bering Strait from Siberia, Dorset ivory masks adorn the bowhead’s lower jaw and its back. A Thule ivory comb lies across the top of the whale’s head, representing the Inuit expansion across Canada. The pattern on the whale’s side mimics the walls of an igloo, while the amauti design that graces the whale’s tale symbolizes the clothing worn by Inuit women. The president of the Royal Canadian Mint, Ian Bennett, was on hand Friday morning to help unveil Canada's latest quarter coins at the Nellie McClung branch of the Greater Victoria Public Library. 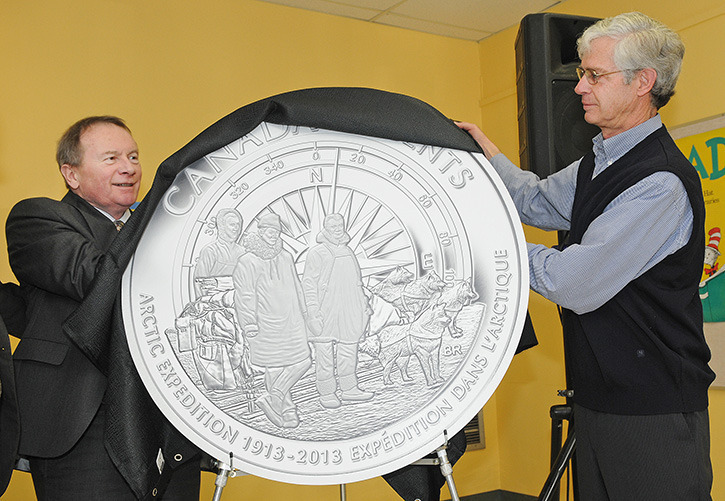 The coins celebrate the 100th anniversary of Canada's first official Arctic expedition as well as life in the north. The expedition set out from Victoria, sailing from Esquimalt harbour. The Prime Minister at the time Sir Robert Borden sent the expedition to map the western Arctic and to study the peoples, wildlife and geology.